Love this game and it seems to be ripe for expansions. Has anyone heard anything? The deep reduction in retail price doesnt give me warm fuzzies about getting any and thats a shame. The MSRP on this game was way too high for what you got. I agree, I think the game would do great with some expansion material, though. I agree that the MSRP was a bit high. I also agree that there is obvious (& probably intentional) room for expansions for this game, & I would welcome them. However, I don't feel like the game is incomplete, which is different than some games where I can see room for expansions. I'd love to see an expansion, but I could live with it if there wasn't one. CMON's typical model seems to run toward lots of expansions, so surely they've got something in mind. I actually remember thinking that the insert seemed to have been designed with space for an expansion in mind. I agree that this game could have been cheaper, I think I would have actually preferred it with meeples and a smaller box but that might just be me. There is lots of space within the design for an expansion, whether they will do one or not is another question. Here's hoping. I remember seeing an interview with Eric Lang once where he said that the plan was this was it. Hence the reason they just released this game and did not kickstart it as they do everything else. That could change I suppose in the future but he said the plan was to do this game as a one-off and be done. Great game and such an awesome game to bring people further into the hobby. I would be totally down with an expansion! The design of the box insert led me to believe an expansion was eminent. I'm sure it was. But it didn't get the praise and thus the sales. I absolutely love it though, it's a great game. Lang has said it was meant to be a stand alone game. But I'd love to see more. At the CMON Expo in Atlanta recently, it was a giveaway in the swag bag! Have they given up on it, or are they trying to relaunch it? -1 ally for the 3 acts ("the nurse") that prevents one of your men to be killed for the current act(I-thug/II-family member/III-any miniature). 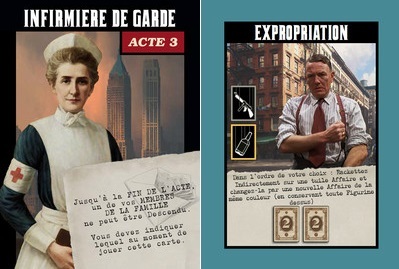 -A new blue job ("expropriation"), 6 cards (with 3 different associations of illegal goods) that allows you to Shake Down the Back of a Business tile (not a printed one) and replace it before or after doing that by a new tile (same color). Those 6 cards replace 6 "shakedown" blue cards. In the base game "shakedown" is the only blue business, this way you can create something interesting, in order to upgrade one of your controlled business (hoping to get a better tile) or to prevent your opponent to use a powerfull tile by replacing it by a new one. very clever. I like them both.